When she woke again, Katie was warm. It was the type of warmth that promoted turning off the alarm and sleeping until noon. A good, lazy Saturday morning, and when she finally got up, her dad would chide her for being lazy. They’d have a late breakfast of eggs and scrapple and orange juice on the cabin’s porch and let the sun warm her face and brown her skin. The birds would sing in the trees but beyond that, it would be so quiet. Peaceful. Safe from her mother. Safe from the kids at school who knew. Safe from the mothers who picked up their children instead of letting them ride on the bus with her. Here, no one bothered her. No one knew except Lindsay and they hadn’t even talked about it. Her dad knew, he had to know by now. Didn’t he? Her eyes opened and she began to hyperventilate. She was disoriented and for a brief moment she thought the cot above her was the wall. She tried to turn around and instead she fell off the cot she was laying on and hit the floor. A sharp, but brief pain shot up her arm and shocked her back into full consciousness. She was in her dad’s bunker. They were sealed in. Something happened to the people in the town. They’d gone crazy and attacked them. Her dad shot them. He’d blown Samantha’s head off, but Samantha tried to bite her. “Dad!” she cried out, all the fear and helplessness of those events punching through her. Suddenly it was all too much. She began to cry in big, heaping sobs, her breathing labored. The reasons, the whys behind her distress were confusing and insubstantial. She’d been strong, tried to hold it in, but now it was pouring out of her like water bursting from a dam. Lindsay was the first one there, her skinny arms wrapping around her shoulders. Thin, delicate hands dug into her hair. Nails raked gently against her scalp. She said words but they were just sounds to Katie. Soothing sounds. Good sounds. Her dad was there a moment later. He lifted her chin with his rough, thick fingers and shined a light in her eyes. It made Katie blink and shocked her out of her uncontrolled sobs. “Katie, honey, listen to me,” her dad said. His blue eyes were so clear, so much like her own. People always said she had his eyes. She managed a nod. He smiled at her, his face still unshaven. The image of her father with a growing beard brought the recent events back in full. It chased away the last of the fog in her mind and replaced it with a sudden numbness. The fear was iced over. She looked down at her right shoulder and saw that the glass was no longer protruding from it. When she shrugged, it protested, but the pain was bearable. Only then did Lindsay let her go, sitting on her knees and looking concerned. “It’ll hurt for a while, but it wasn’t as deep as I thought.” Her dad moved in close and pulled back the neckline of Katie’s t-shirt. There was a clean bandage over the wound with only a hint of bleeding seeping through. He peeled the bandage away slightly and then replaced it and her shirt again. He looked surprised. Twenty-eight hours. A lot can happen in twenty-eight hours. Katie rose slowly and sat down on her cot. They were in the living quarters of her dad’s bunker. A plain, white room with six cots arrayed along one side of the room. One cot was placed above another, creating three columns of two cots each. The other side of the room had a desk, a dresser and a bookshelf. There were two doors at the far end of the room. One that led towards the supply room and bathroom and the other connected to the main room and radio room. In the background, Katie made out the faint whisper of the air-cleaner filtering air from the outside before pumping it down into the bunker. Her dad licked his lips and turned to look at the doorway to the main room. She waited, drawing Lindsay up to sit next to her and holding her friend’s hand tightly in both of her own. He would tell her in his own time, once he realized she wasn’t going to let him ignore it. After nearly a minute of quiet pacing, her dad stopped and sat on the desk opposite them. He laced his hands together between his knees and looked right at her. Their eyes met and held. Her dad was always calm, composed, unworried, but she saw worry in his eyes now. It was bad then, very bad. Bill was her dad’s army buddy, who still worked down at the base about fifty miles south. They talked on the CB a lot, usually when he was in the bunker and needed “intel” as he always called it. There wasn’t a summer that her dad didn’t prepare for an extended stay, though Katie figured that might have all been part of their bonding time. She never minded it, and it made him happy. She liked when her dad was happy. Ever since the divorce, that was pretty rare. “So what is the army doing?” she said, glancing at Lindsay. Her friend sat with her head down, lips pressed tight together. She gave Lindsay’s hand a squeeze but nothing was returned. “What?” Katie found that a little hard to believe. If this was a virus, a bioweapon of some sort, it turned people into maniacs. Samantha tried to… She tried to kill me, Katie realized. Several things struck her at once. Mister Turner’s legs being severed. His endless banging on the rooftop. The way his hand pushed through the window, peeling his skin off. None of that bothered him. And he’d been trying to kill her too. Bite her. Katie turned from Lindsay to her dad, frowning. Until that moment, she hadn’t thought about Mrs Volk. She hadn’t had a thought for anyone in the town really, or even her mom back in New York. She’s not in the city, so she’s fine. “The power might be out at the house!” Lindsay said, suddenly standing, ripping her hand free from Katie’s. “That storm was bad! Our power always goes out! And she never charges her cell phone… never… I told her to charge it…” Katie stood to pull her into her arms when Lindsay began to cry. Over her friend’s shoulder, she gave her dad a look. He set his jaw, shaking his head. “That’s enough,” he said, his voice an angry bark. Katie stiffened, but kept Lindsay held tightly. Her friend’s sobbing was slowing, but Katie still felt warm, wet tears against her neck and shoulder. Surprisingly, her own wound barely hurt now, even with Lindsay pressing against it. Her anger calmed but when she looked at Lindsay again and saw the pain in her expression, resolve took its place. She moved down to the supply door and unlatched it, then looked inside. Her dad called after her, but she ignored him. Flipping on the light, she walked passed the rows of shelving and their stored goods to a metal cabinet. It had a combination lock that she quickly dialed in and pulled open. “Katherine, stop. This is ridiculous, you’re not even healed.” Her dad had followed her and was now standing by the quietly humming freezer. She turned away and reached in, pulling out an AR-15 carbine. It was as familiar to her as a friend. Some of her best memories recently involved firing the weapon on the range behind her dad’s cabin. She eventually trained others how to shoot too, as part of her dad’s survival courses. She’d even taught Samantha once, when her dad was out of town. She’d never told him about that. “To protect your family,” Katie said and knelt to draw out a box of ammunition. She began to fill the magazines. “To survive right? You knew something like this would happen.” She paused with her thumb on a cartridge as it clicked into place. He knew something like this would happen. “Dad, what else do you know about this?” She didn’t look at him. Not out of disgust or fear, but because she needed to hear him. She could always hear when her dad lied. 2009. That was when her dad was discharged. That’s when it all started, when he started preparing, when he made the bunker. When her family began to fall apart. A hand on her wounded shoulder brought something more to mind. “Kurama?” She stood and looked at him. His face looked as worn and tired as he sounded. “Dad. They made that wonder cure drug. The one they made us all get?” She rolled up her sleeve and pulled it over her shoulder to show the scar it left. She frowned, feeling that fear growing inside of her again. Her mind tried to process what he said but it felt too unreal, too impossible to even consider. They die and THEN they go insane? They both turned to see Lindsay standing in the doorway. She was shaking, her hands wrapped around herself. When Katie tried to meet her eyes, Lindsay just turned away. Her dad said nothing, but turned to the cabinet and pulled out another rifle similar to her own. 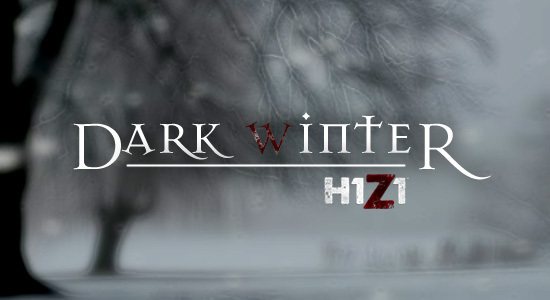 This entry was posted in Dark Winter, Fan Fiction and tagged blog fiction, Dark Winter, Fan Fiction, H1Z1, Mike Kern, Zombie Apocalypse. Bookmark the permalink.